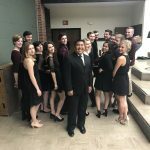 Illinois Wesleyan University’s premier vocal jazz ensemble, Unlicensed Syncopation, was established in January 2015. 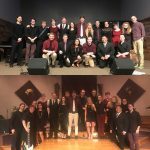 This ensemble focuses on the study and performance of jazz and jazz-influenced music in large ensemble, small ensemble, and solo settings. The music studied by the ensemble features close harmonies as well as opportunities for building improvisation skills. 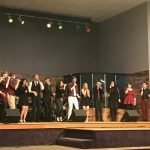 The students in this ensemble learn about the practice and performance of high-quality contemporary vocal literature by highly regarded vocal jazz arrangers. They also learn about the technology involved in the performance of this type of music, including appropriate microphone technique, as well as the setup of the soundboard, speakers, and monitors. The ensemble is open to any IWU student. There are 10-14 vocalists chosen to be in the ensemble, as well as a rhythm section (piano, bass, drums, and guitar). 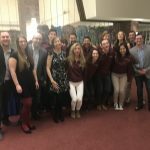 There is a rigorous audition process that takes place at the beginning of the academic school year in order to determine placement in the ensemble. 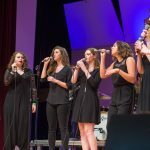 The Vocal Jazz Lab Ensemble, established during the 2016-2017 school year, is designed for students who may have limited experience singing in vocal jazz ensembles in order to help them build their abilities in sight-singing, jazz style, and improvisation. This ensemble will perform at least once per semester, and is open to any IWU student. 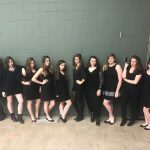 Check out the IWU Vocal Jazz Facebook page for more information, as well as snippets of rehearsals and performances!